(Newser) – The US economy added just 126,000 jobs in March—not even close to the 248,000 economists had expected, the Wall Street Journal reports. 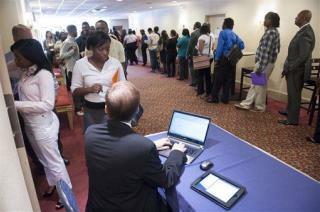 The unemployment rate remained unchanged, at 5.5%. At the Journal, Paul Vigna calls the jobs number a "surprise," noting that's the slimmest gain since December 2013. In more gloomy news, February and January new jobs numbers were revised down: February saw 264,000 jobs added, not the previously reported 295,000, and January was revised from 239,000 to 201,000—after already having been revised from an original estimate of 257,000. The time will come when we'll take our Country back, but it's going to get very, very ugly first. Oppression creates the force that devours it. (sorry accidentally clicked and up voted myself). Oh so NOW they're acknowledging the factory slowdowns. Yet continue to allow those factories to close down and send work to China (without properly taxing the manufactured goods that are imported right back in here)! Our jackwagon government should make it a financial burden to have goods made elsewhere. Make it sensible for corporations to keep the jobs here! Uncontrolled immigration into western countries has contributed to a dissipating economy, disturbing crime statistics, a high rate of unemployment among natives, swollen welfare rolls so out of control they are practically bankrupting Western countries, and has even led to an unprecedented wave of terrorism. But the gravest problem of massive immigration, that which dwarfs all the rest, is the supplanting of the native labor force, of with people who quite often do not share those values that were and are the cornerstone of Western Civilization.